Goku and Bulma continue their search for the Dragonballs, and thanks to Bulma’s Dragonball Radar, they learn that they are very close to their fifth Dragonball. On the way there, Bulma falls off her motorcycle, and when Goku comes to check on her, his dragonball begins to glow. Both of them look ahead and see a small village. Goku decides to check there for a Dragonball. The two enter the village, only to see no one there. Bulma thinks it is a ghost town, but Goku feels that there are people there. Goku heads to the Sherman Priest’s door, and since it is locked, he punches it open. As soon as he enters, a heavy axe comes crashing down on his head, only to give him a small lump. The priest with the axe tells him not to take his daughter, but Goku reveals that he is not whoever the Sherman Priest thinks he is. The Sherman priest tells Goku and Bulma that a shape shifting monster named Oolong, has been taking away the villager’s daughters, and is looking for his daughter next, Pochawompa. Bulma asks the Sherman Priest if he has a seen a dragonball around, and shows him one. By now, the village realizes that Oolong is nowhere in sight, and are all at the Sherman Priest’s front door. An old lady shows Bulma a six-star dragonball, and Goku asks for it. The woman refuses, saying it was passed down from other generations. Bulma asks the lady if she can have it if she and Goku defeat Oolong, and get the girls back. 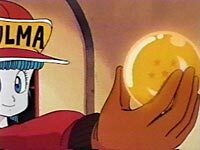 The village says that is Oolong cannot be defeated, but Bulma comes up with a plan. Goku dresses up like Pochawompa and waits outside the village. Oolong comes crashing in, in the form of a devil in a tux with flowers. Oolong asks for Pochawompa to marry him, but Goku, still disguised, needs to take a ‘pit stop’. Oolong then changes into the form of a handsome man, and Bulma, watching from indoors, is lured by Oolong’s new form. Oolong, who takes a liking to Bulma immediately, debates whether he should take her or Goku (Pochawompa). Checking on Pochawompa, he realizes that “she” is taking a leak and finally realizes that he has been tricked. Oolong again changes form into a huge bull. Goku takes off the disguise, and gets ready to fight Oolong, but Oolong runs away at the last second. Goku chases him, and when he gets outside the gates, he sees a small pig. The pig tells Goku that Oolong went to the other side of the town, and Goku runs after him. 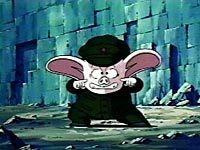 After Goku leaves, the pig reveals himself as Oolong, in his true form. After going to shape-shifting school, Oolong learned to take different forms, but there was one catch: he could only take a certain form for 5 minutes and no longer. Oolong explains that he had to terrorize the village since he was constantly being dumped by girls and needed some girlfriends. Goku returns to the village, and tells the pig that he didn’t find Oolong. Oolong takes the form now of a huge metal ninja, and tells Goku that if he runs away, he will not be dipped in Oolong’s hot soup. Goku says he won’t leave, and Oolong accidentally dips his finger in the soup! From behind, a young boy shoots a slingshot at the back of Oolong’s neck, but his mother carries him away. Oolong turns back to Goku who reminds him that he was going to kill him. Oolong suddenly turn into a bat and flies away. Bulma reminds Goku that he has to find the lost girls, so Goku calls for his Nimbus cloud and pursues Oolong. Goku is not far behind Oolong, but Oolong changes form again, this time into a rocket. In the middle of the chase, Oolong turns back to his normal form and falls to the ground. Goku ties him up and takes him back to the village. Oolong apologizes to the villagers, and then takes him to his “shack”, which is really a large house, and shows the daughters. All of them are relaxed and are asking Oolong favors. Oolong pleads with the villagers to take their kids back, seeing how they are so much trouble. Goku and Bulma return to the village, and the old lady presents them with the 6-star Dragonball! With 5 Dragonballs, the other two shouldn’t be far away! asked if they had seen one. 6 star ball as she said she would.The episode ends now!!!!!!! weren't kidnapped they were just having fun.